Ice cream works well itself as the perfect dessert for anytime. It can work much better if it is served with a poached pear. Since my baby was born, she gives me the motivation for making good eat for her everyday. You’re tired for sometime, but you’ll be even more fatigue if your baby has no interest with food. Baby likes poached pear a lot, at least for the case of my baby. Don’t be worried of the alcohol. The boiling process would kill any liqueur elements and it’s totally safe for baby’s health. You should choose bosc pears for poaching or any pear that is firm and has little water if you don’t have bosc pears in hand. 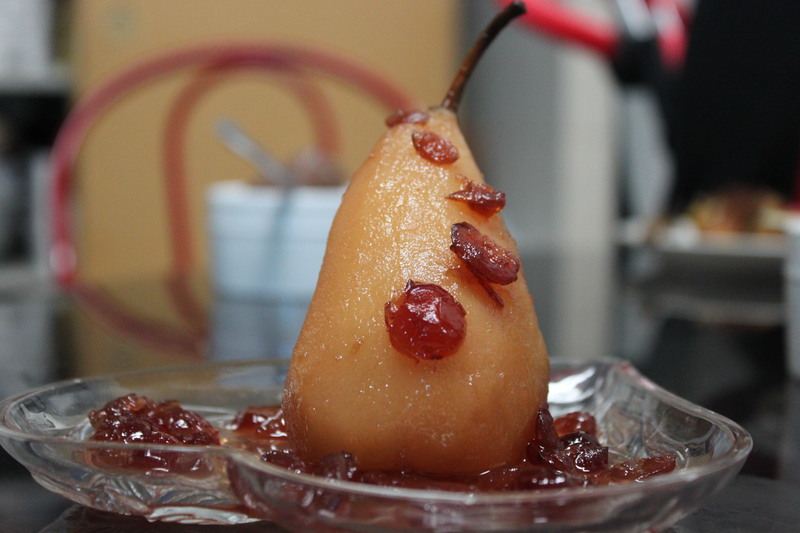 Pears are poached usually with marsala wine and vanilla beans. Why don’t you try this recipe of mine. That’s sweet and works really good with vanilla ice cream. – Add dry cranberries and continue to boil the pears for 10 more minutes or until the pears are tender but not so soft that can be fallen apart. – Use 2 tbsp water to mix with corn starch. Add the corn starch liquid to the poached pear liquid slowly until the liquid reach the consistence. – Add more sugar as your taste. Cool the syrup in refrigerator. – Pour the syrup over the poached pear and serve with vanilla ice cream. This entry was posted in dessert, fruits and tagged fruits, wine. Bookmark the permalink.